Over their 140-year history, the State Buildings (also known as the Central Government Offices and Old Treasury Buildings) have been used as Public Offices, a Police Court and cellblock, Treasury, Survey Department, GPO, Immigration Offices, office of the Premier and Cabinet, Lands Department and Titles Building. However, towards the end of the 20th century, the buildings were vacated and stood empty for nearly two decades. 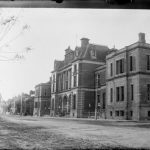 Starting with just three small buildings to run all of State Government business, various additions were made to the site on the corner of Barrack Street and St Georges Terrace, firstly in 1874, designed by Richard Roach Jewell. It was not until 1890 that the complex started to take on its more familiar look, when architect George Temple Poole drew up plans for a new General Post Office in the French Second Empire Style. More buildings, and sometimes additional storeys to existing buildings, were added, and in 1904 the facades of the older buildings were remodelled to match Poole’s GPO, giving State Buildings its much-admired elevations which remain today. During the last half of the 20th century, various government departments left the building for new accommodation, with the last being the Department of Land Administration which moved to new premises in Midland in 1993. After this, the site was empty for nearly two decades and a variety of proposals for its redevelopment never saw the light of day. However, it now has a new lease of life with a variety of upmarket bars, cafes and retail spaces, including the luxury COMO The Treasury Hotel. Over their 140 year history, the State Buildings (also known as the Central Government Offices and Old Treasury Building) have been used as Public Offices, a Police Court and cellblock, Treasury, Survey Department, GPO, Immigration Offices, Office of the Premier and Cabinet, Lands Department and Titles Building. However, towards the end of the 20th century, the buildings were vacated and stood empty for nearly two decades. Today they have been sensitively redeveloped into a hospitality and retail complex, including the luxury COMO The Treasury Hotel. As early as the 1840s, more office space was needed to accommodate the growing public service. A government administration building had been erected in 1836 on the southern side of St. Georges Terrace, between Government House and Stirling Gardens, and although some additions were made to the building, further expansion could not be carried out due to lack of funds in the struggling colony. In fact, all government business was conducted within three small buildings on the Terrace. One contained offices for the Colonial Secretary, the Colonial Treasurer, the Attorney General, the Survey, and other departments. 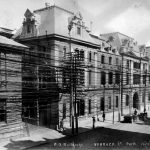 On the other side of the street was the Comptroller General’s office, which technically belonged to the Imperial Government, and the old building used as a Post Office. It was not until Western Australia was granted representative government in 1870 that the colony had the ability to raise loans. The passing of the Loans Acts permitted an increased public works programme, and the Public Works Department was established. The Government commenced construction of new offices in a very modest way. Around 1873 a very simple building designed by Richard Roach Jewell in the ‘workhouse style’, with no decorative embellishments was built. It was later occupied by Public Works, the Police, and the Attorney General’s Departments. The West Australian described these types of buildings as a “rectangular brick box with a few holes in it for doors and windows” and demanded more attractive facades for St Georges Terrace. More additions were made in the next few years, including a Colonial Secretary’s office, the Treasury and the Audit office, followed in 1882 by Jewell’s design for a two-storey building on the corner of St Georges Terrace and Cathedral Avenue for the Lands and Surveys Department. After his retirement in 1884, the new Colonial Architect, George Temple Poole, was commissioned to link the various wings with a new building. 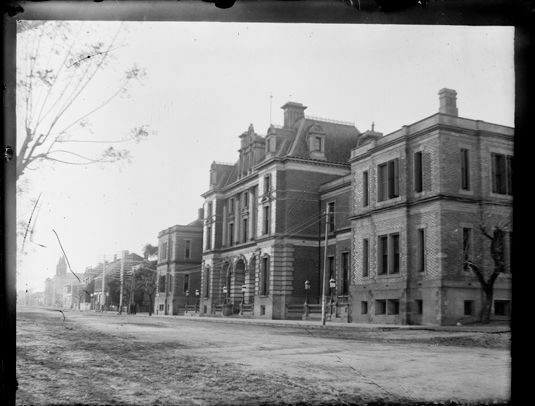 Complications arose when it was discovered that the foundation of an earlier Jewell wing were faulty, but finally, in 1890, the two wings of government offices along St Georges Terrace were united by replacing the old Barracks with a two-storey building to be occupied by the General Post Office. The new additions were very different from Jewell’s simpler facades, instead being in the French Second Empire Style. In 1893 a further wing for the Department of Lands and Surveys was added to the State Buildings, with Poole once again being influenced by French architectural trends. The Lands and Survey Building was the first government building to contain a lift. Interior finishes including the walls of the public hall were painted in three shades of green. The last of the major buildings was the Land Titles Office building, constructed in 1897. A five-storey building, again designed by Poole, the building was constructed on the corner of Cathedral Avenue and Hay Street, with the main entrance in Cathedral Avenue. 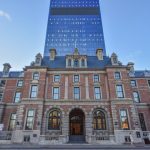 The building accommodated the Land Titles Office, Audit, Treasury, Colonial Secretary’s Department, and additional office space for the Public Works Department. In 1898, a third storey was added to the Post and Telegraph building. The main hall of the General Post Office was renovated and electric lights were installed. 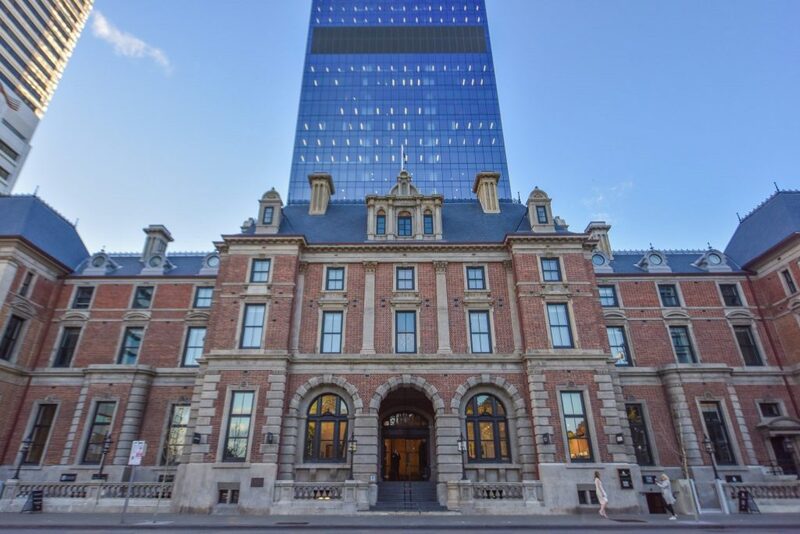 In 1902 a third storey was also added to the 1883 Jewell wing, for additional office space and in 1904 an additional storey, with eight large offices, was added to the 1874-78 wings. At the same time Jewell’s simple facades were remodelled to resemble the style Poole had used for the General Post Office. 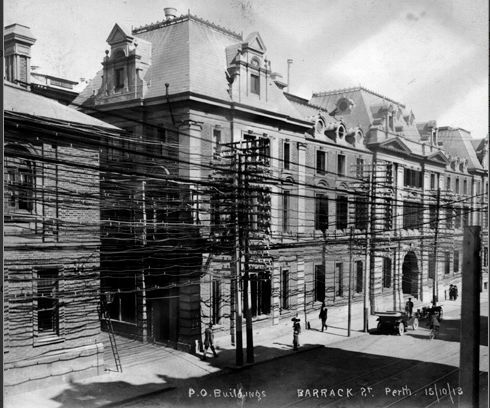 When the General Post Office was moved to a new building in Forrest Place in 1923, the old GPO was renovated to become additional government offices. During the last half of the 20th century, various government departments left the building for new accommodation, with the last being the Department of Land Administration which moved to new premises in Midland in 1993. After this, the site was empty for nearly two decades and a variety of proposals for its redevelopment never saw the light of day. However, it now has a new lease of life with a variety of upmarket bars, cafes and retail spaces, COMO The Treasury Hotel, one of Perth’s top hotels. State Buildings is likely to remain a key tourist attraction in Perth for many years to come.